Five Good Ideas Science Fiction Teaches Us to Fear via mythcreants. I hope you enjoyed Five Bad Ideas that Science Fiction Teaches Us to Love last week. As promised, here is the follow-up to that post. Duct Tape 101 via LenieHokansson. A certain sibling of mine is a whiz at anything related to fixing up his house. He’s constantly coming up with weekend projects to make his home even nicer than it already is. I know he reads this blog, and I wonder how many of these tricks he’s tried. 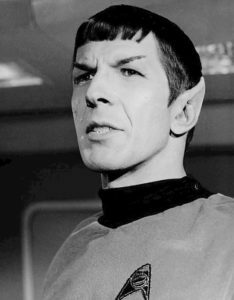 How Mr. Spock Helped a Bi Kid Learn How to Fit In. I loved this story. Treebound. Maybe this is what really happened to the Ents long after the events of the Lord of the Rings trilogy. At any rate, I prefer it to what happened in the canon. The Strange Case of the Dented Forehead via ‪StuartRWest‬. I really want a follow-up post to this one that explains whether Stuart really has a dented forehead and, if so, where it came from. Sticks are probably where the story of craft begins—the point at which our very distant ancestors progressed from animalistic existences to lives materially enhanced by the objects around them.